Often referred to as breathability, vapour permeability describes a materials ability to allow water vapour to pass through it. You may well hear builders and / or people in the damp proofing industry referring to things being “able to breathe”. This in itself is a bit of a misnomer because some may well say that; “a building, or building materials cannot breathe, as to breathe requires lungs to exchange air”. However, the term “breathability” does not, as the term might imply, relate to an exchange of air. Instead it is the ability of a material to allow moisture vapour to pass through it. Materials used in construction may carry this out in numerous different ways, and exchange of air is only one possible avenue. So! Vapour permeability is the property of a material which permits the passage of water vapour through it; the time rate of water vapour transmission through a unit area of flat material of unit thickness, induced by a unit vapour pressure difference between two specific surfaces, under specified temperature and humidity conditions. Yes! It is that convoluted! Moisture vapour permeability (MVP) and moisture vapour transmission (MVT) are perhaps better, and certainly more technical, terms to use than breathability. Trouble is, they are also wordy technical terms, likely to result in people switching off; whereas, breathability is something which people can picture in their minds. Trying to keep things simple and not bore you, the reader, too much with technical details, what we are looking at here, are the differences in the way some plaster / render materials will breathe, or be vapour permeable. Another of the things you may hear us, in the damp proofing industry talk about is, “trapped moisture”, which can be the case where damp ingress, or rising damp has occurred and there is a hard render on the outside of the property, as well as on the inside. In this respect, we are referring to walls which are above ground level and not subterranean. Due to the nature of the materials used, a dense, sand / cement render has a reduced capacity to allow the passage of moisture, in the form of vapour, to pass through it. This means that, where damp proofing work is carried out and the wall is rendered internally, then full “drying”, as a result of the movement of moisture vapour, is going to take a considerable time to occur and in some cases, will never happen completely. This is one of the main reasons for using a salt inhibiting additive into render mixes. We know that the residual hygroscopic salts will remain in the substrate but we do not want them to pass through the render materials whilst drying is occurring. 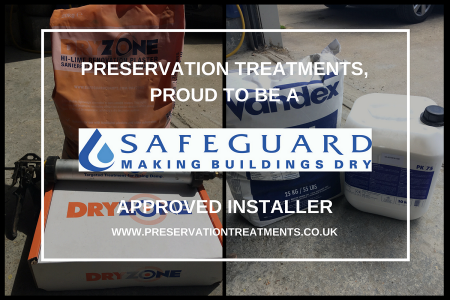 More and more, in conjunction with the installation of a damp-proof course, or indeed other above ground situations, we are trying to use Safeguard Dryzone Hi-lime renovating plasters, which have a greater breathability, or vapour permeability. We know that once damp proofing work, or other sources of damp ingress have been rectified have been carried out, we want the residual moisture left within the wall substrate to dry out. A drier wall will ensure a far better success rate in preventing the movement of hygroscopic salts to the finish plaster and, very importantly, a drier wall is a warmer wall. The cups you see in the picture are sealed units, which were filled with KN03 which creates a 95% RH air gap. The first one (on the left) is a control unit, where the cup was simply sealed and it is quite clear that over the 18-month period, not much water has passed through the seal. Therefore, it is not particularly vapour permeable. 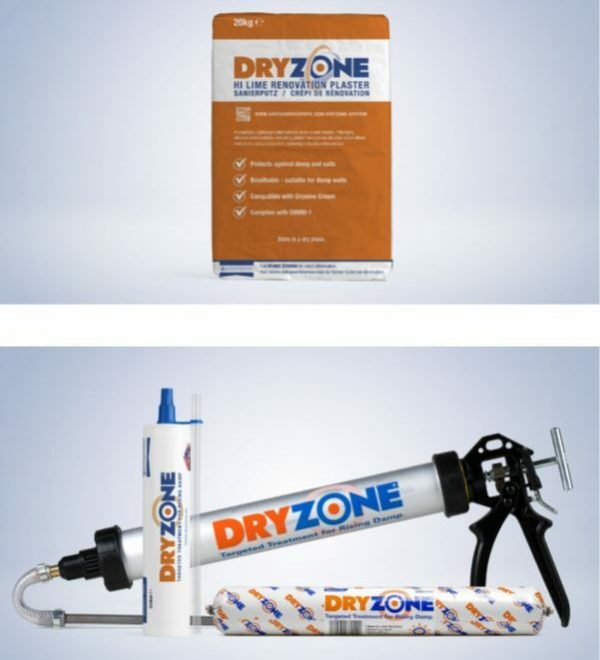 However, it is very clear to see that the best performer, in the test carried out, is the Dryzone Hi-Lime plaster. During the 18-month test, all of the water in the cup has evaporated by way of moisture vapour, through the material used to seal the cup. Hopefully, there is a little insight into the meaning of vapour permeability, or the “breathability” of plastering materials and why it is important.